No more questions about criminal convictions on job applications. The President has called on Congress to follow a growing number of states, cities, and private companies that have decided to “ban the box” on job applications. We are encouraged that Congress is considering bipartisan legislation that would “ban the box” for federal hiring and hiring by federal contractors. In the meantime, the President is directing the Office of Personnel Management (OPM) to take action where it can by modifying its rules to delay inquiries into criminal history until later in the hiring process. While most agencies already have taken this step, this action will better ensure that applicants from all segments of society, including those with prior criminal histories, receive a fair opportunity to compete for Federal employment. Yep, a federal ban the box bill sits in Committee in both the House and Senate. And, sure enough, many states and localities have already banned the box — like Philly, for example. Indeed, as this contribution from Tessie Castillo at The Huffington Post fleshes out, many large corporations ban the box, even without the law requiring them to do so. 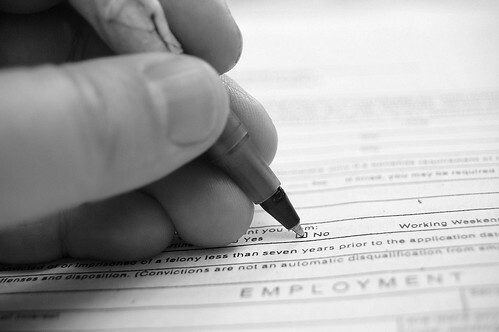 Generally, ban the box forbids employers from asking job applicants about criminal convictions on a job application or, often, until after the first job interview. Still, most employers will eventually run background checks on job applicants — as well they should. Still, many states, such as Pennsylvania and New Jersey, hamstring companies from automatically declining an applicant based on background check results. Rather, the employer must balance a criminal conviction with the applicant’s suitability for employment in the applied-for position. Similarly, criminal background checks remain a hot-button issue for the EEOC, given the potential for discrimination. In other words, when using a background check to make an employment decision, consider consulting an employment lawyer. Image Credit: Kathryn Decker on Flickr.